The following is a reference/historical list of the 70-millimeter engagements of “The Concert for Bangladesh” in North America. 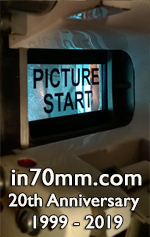 These were full-frame (2.20:1) prints blown-up from 16mm photography and included discrete six-track audio. The Apple/20th Century-Fox release was directed by Saul Swimmer and featured musical performances by Eric Clapton, Bob Dylan, George Harrison, Ravi Shankar, and many others. 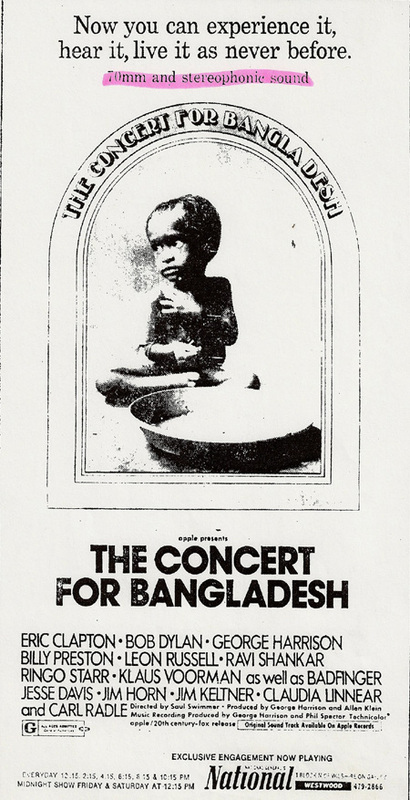 “The Concert for Bangladesh” was among six 1972 first-run films released with 70mm prints for selected engagements. Some engagements were double-billed with another film and/or a 35mm presentation during the latter week(s) of their run. This information has been principally referenced from film industry trade publications and regional newspaper promotion, with thanks to Paul Linfesty and Vince Young. International engagements have not been accounted for in this article.